Controversial business man Steve Mbogo on Friday was in drama after DCI recovered Range Rover from him for evading duty and fraudulently obtaining number plates. The businessman’s Range Rover was registered as a Toyota Probox and police say he has been avoiding the tax. “Detectives have today afternoon recovered a range rover from mr. Steve mbogo for the offence of evading duty and fraudulently obtaining number plates. Upon carrying out preliminary investigations, the vehicle number plates were found to belong to a probox.” said DCI. 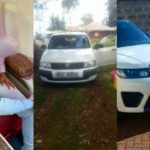 Mbogo in return tweeted that he bought the car in 2017 and even had the documents to prove it. “Today I was intercepted by cid officers on claims that my car had fake plates! I bought the car in 2017 and conducted a search from ntsa as below! I have all valid agreements n search results!” he said. Kenyans however, in the comment section insisted that the businessman is a conman and all the things he has are never legit. Character Since the impound, Mbogo took to instagram to share his first post saying that character of a man is everything. “Character cannot be developed in ease and quiet. Only through experience of trial and suffering can the soul be strengthened, ambition inspired, and success achieved.” he posted. The post “Only through experience of trial and suffering can the soul be strengthened” Steve Mbogo’s first post since his car was nabbed appeared first on Ghafla! Kenya.